David A. Kyle at Chicon 7. Photo by John L. Coker III. David A. Kyle, who chaired the 1956 Worldcon (NyCon II) and was fan Guest of Honor at the 1983 Worldcon (ConStellation), died September 18 at 4:30 p.m. EDT “of complication from an endoscopy” reports his daughter Kerry. Just yesterday Kyle had been shown on Facebook enjoying New York fandom’s “End of Summer” party. I know he was 97 and frail, but his spirit was strong, his heart was huge, and I’m still in shock. I’m still surprised. I expected him to last a few more years. I expected to be making him dinner tonight. And I’m bereft. And at the moment I don’t really want to type much. I know many in the Fannish community loved Dad as well and are equally as bereft reading this. I hope it …makes you feel better to know that, as always, Dad chatted about science fiction with the EMT who brought him to the hospital and with the nurses who made him comfortable. He chatted about the love of his life–science fiction–genuinely interested in hearing what they read and watched. Always spreading the word and wishing to instill within them the flame he had within himself. And, yes, he made constant jokes and terrible puns that charmed everyone in the hospital…. Dave’s wife, Ruth, predeceased him in 2011. They met at a convention in 1955. The next year she served as Secretary of the Worldcon in New York, which Dave chaired, and the year after that they married, trufannishly honeymooning at the 1957 Worldcon in England, traveling there with 53 friends and in-laws on a specially chartered flight. Dave and Ruth had two children, Arthur and Kerry. Kyle was one of the most active fans from sf fandom’s earliest days. He attended the 1936 meeting of New York and Philly fans which decided to dub itself the first science fiction convention in advance of the Leeds event announced for 1937. He wrote the “Yellow Pamphlet” that helped inspire the “The Great Exclusion Act of 1939” but, unlike his fellow Futurians, was not kicked out of the First Worldcon. In later years he was made a Knight of The Order of Saint Fantony, won the Big Heart Award, and in 1988 received the First Fandom Hall of Fame Award. Kyle also had a notable professional sf career. Dave Kyle and Martin Greenberg made history by co-founding Gnome Press in 1948. Together they published dozens of volumes of classic sf in hardcover for the first time. Gnome Press went under in 1962. Kyle’s 1956 NyCon II is particularly remembered for producing the year’s Hugo Awards by affixing Oldsmobile rockets to a decorative wooden backing. The L-shaped base displayed the rocket standing upright while concealing its hollow underside. A list of Kyle’s autobiographical fanhistory articles for Mimosa can be found here. 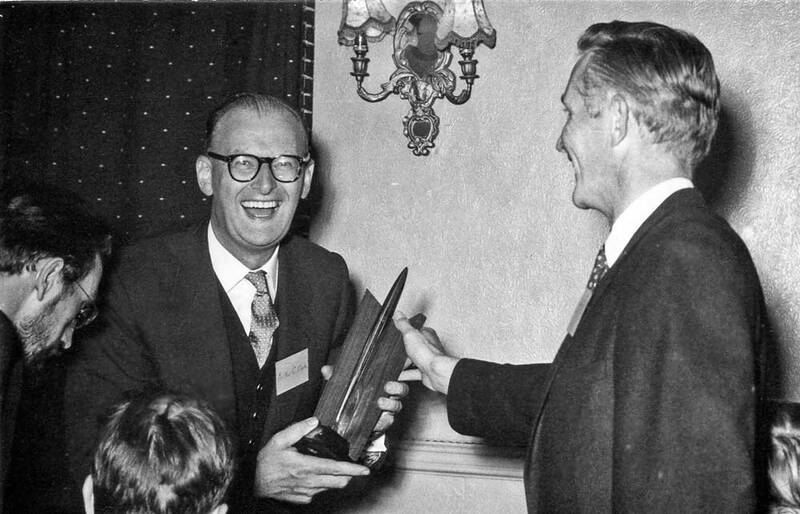 Arthur C. Clarke receives Hugo Award from chairman Dave Kyle at the 1956 Worldcon, NyCon II. This entry was posted in 30s Fanhistory, 40s Fanhistory, 50s Fanhistory, 60s Fanhistory, 70s Fanhistory, 80s Fanhistory, In Passing and tagged Dave Kyle, NyCon II by Mike Glyer. Bookmark the permalink. Sad news. He was a great guy. I’ll miss him. The first photo is exactly how I remember him, since that’s one of the last places I saw him. The second one, of course, is the one FB insists on using in the thumbnail when I share the article. We do not come again. We do not come. Ever again. Mike, you’re welcome to use any of my many photos of Dave I sent to you. Nicki and I are grateful to have published Dave’s articles in Mimosa. He was the person who whetted our interest in fan history when he commented to us, at the 1979 NorthAmericon, that he didn’t think there was enough fan history in fanzines. Only two left, now, who attended the very first Worldcon back in 1939. We have lost one of fandom’s founding fathers. I guess we can sit there now. Or here. It’s a cliche to say he’ll be missed. Sometimes cliches are all we get. Nothing useful to say. I’m just sad. Now Dave can sit everywhere. I’m so sorry to hear this. While I only ever talked with him briefly, his love of science fiction and of fandom was unmistakable. He will be greatly missed. I just saw him on Saturday and can hardly believe the news. He wasn’t just one of the oldest and most lasting fans, he was also one of the best and most accomplished. It was a privilege to be his friend, but one he granted freely. Fandom won’t be the same without him, and I will be just one of many who will miss him greatly. Words can’t express the sadness I’m feeling. Dave was a link with the early days of fandom. He was also someone with whom I enjoyed spending time. I will never forget his willingness to talk about SF and fandom, his red jacket, his book that many of us wrote in many times, and his quietly cheerful attitude. Blessing to all of his family and to fandom as well. David was a presence in fandom like few others; through him can be traced the history of this subculture. He was one of the first people I met when I started going to conventions as a teenager in the early 70’s, and when I researched the 1939 Worldcon for my novel Arkwright, he was one of my principal sources. Archived on my Facebook page is a photo of us together at Readercon a couple years ago; I’m crouched beside his scooter, asking him questions about the end-of-convention softball game in Queens. My lost my mother a couple of weeks ago. At age 96, she and David were approximately the same age. So whenever I saw Dave recently, I’d think that there was hope for my mother to remain with us just a little while longer. Dave didn’t know it, but he was kind of mortality scale. She passed away earlier this month; ten days later, David is gone, too. Good scale. Thanks for being here, Dave. Go easy. Good bye Dave. I’m so very glad that we met and got to hang out here and there over the years! See you on the Riverworld! I wish Dave Kyle had written his memoirs, but I’d like to thank Rich and Nicki Lynch for getting him to write many articles for MIMOSA (as well as their other efforts to preserve fan history). @Allen Steele, condolences also on your mother. Many thanks, Lenore. I appreciate it. I continue to insist – If Forry was the First ‘Fan’, Dave Kyle was the First ‘SMOF’. > crouching beside the scooter – the high point of many a con! When last i saw Dave it was at a maltcon at last year’s Albacon, where he got to savor some truly obscure/fantastic libations. The crowded little room parted for him like the Red Sea. That top photo? The quintessence of Dave: the red jacket, a smile, and a conversation that would cross time and space. In other words, somebody screwed the pooch during a procedure generally considered non-lethally dangerous. This isn’t supposed to happen, and what that phrase says to me is “medical malpractice”. Somebody or -bodies, through incompetence, took him from us before his time. In other words, somebody screwed the pooch during a procedure generally considered safe, even routine with some practitioners. I am neither lawyer nor physician, but it seems to me that Dave’s family perhaps should consider consulting such for second and third opinions and further investigation and/or litigation. David, yes, I was talking about it with a friend who’s an OR nurse. She was appalled at “complications from an endoscopy” as a cause of death. Inexcusable, but I didn’t want to say it. It’s totally up to the Kyle family what they want to do about it. While I never met him I wish I had. I lost my mom a few weeks ago and relate to what you are going through. It feels too soon even if life was long. My heart is with you. Karen Linsley, condolences on your loss. “Dave Kyle says you can’t sit there.” The sign was all over the Kansas City Convention Center last month as fandom remembered one of its founding fathers. It was a wonderful way to say goodbye, even if we didn’t realize it at the time. Arthur and Kerry — My condolences to you, and yours, on your father’s passing. Your father spoke often about you, with love and pride. It was my privilege to know him, and Ruth, as friends and neighbors in New York’s North Country. What I heard in stories, you lived. It must have been amazing. David was a most remarkable human being — kind and gracious, keen and always inquiring, imaginative and impishly mischievous. Many were the puns, and magnificently awful they were! My world dimmed when I learned his spark had gone out. Be proud, and carry it on. Can someone explain “Dave Kyle says you can’t sit there”? At NyCon II in 1956, a bunch of folks who hadn’t payed for the Hugo Banquet decided to sit on a balcony to watch the ceremony, and Dave Kyle sent a gopher to tell them “Dave Kyle says you can’t sit here”. It became a catchphrase. Cally: That’s about it. Dave Kyle wrote an explanation as part of an article for Mimosa 9. Thanks, all. I could tell from context it was a fannish catchphrase but I didn’t know (or at least I didn’t recall) the background. Condolences to AC and Kerry, and to fandom in general. Sadly I didn’t get to speak to him at Worldcon this year. He was one of the first fans I got to know, when he was with the Air Force in England in the ?late fifties?. He had a houseboat on the Thames, ISTR. I am so glad Alicia and I got to visit him and Ruth at Potsdam some years back. I haven’t said anything yet because I always start crying. And there’s so much to say. Most of all I want to thank Kerry and Arthur for sharing their father with me. Of course I knew intellectually how important he was but to me he was the guy who made me feel at home at my first Worldcon. Much later, as he gradually started using a scooter we’d just be hanging out together while Kerry went off to do other things. It took me a long time to get over being surprised when people came up to talk with him tentatively and humbly. He was Dave Kyle! Meanwhile I’d be helping Kerry out with whatever she needed. Yes, he’s the Dave Kyle who said, “You can’t sit there!” Thanks to his family that’s not the person I’m missing. I’m missing a friend. I’m never going to get to kiss him hello again, he mugging for the camera. Or threatening to write wicked things in his book. Or the cheerfully risque flirting. Thank you so very much for sharing this person, your father, with me.